Refugee children living in Chad. A joint assessment by the Office of the United Nations High Commission for Refugees (UNHCR) and the World Food Programme (WFP), has revealed that 43 per cent of refugees who have been living in Chad for more than 10 years continue to face a precarious food security situation and require assistance. Chad is home to some 400,000 refugees, 310,000 of which are from Darfur (Sudan) and another 70,000 from the Central African Republic (CAR). Those from Sudan have been arriving since 2002 while those from CAR have been displaced for more than 10 years. The country has also received 5,000 refugees from Nigeria as a result of the violence perpetuated by Boko Haram. These people are in addition to 100,000 internally displaced persons who live at makeshift sites and 5,000 urban refugees who live in N’Djamena, the country’s capital, without assistance. In addition to the high number of refugees who are food insecure, more than 40 per cent are suffering from chronic malnutrition and the majority of children under the age of five are affected by anaemia. “Lack of resources has forced us to reduce food rations for refugees to less than half,” announced WFP Chad Country Director Mary-Ellen McGroarty, in a joint news release. Biometric registration and careful targeting according to vulnerability and needs have somewhat lessened the impact of the cuts, and the WFP continues to explore opportunities with UNHCR that would link food and non-food assistance to longer-term resilience projects that would benefit both refugees and local communities. In order to diversify refugees’ meals and stimulate local markets, WFP is also looking into cash assistance. However, the short term requires basic food needs to be met in order to prevent further deterioration to their nutritional situation. The joint assessment also reports a need to invest in training, small trade, and microfinance schemes or farming projects. It recommends that voluntary returns ought to be considered once the situation in peoples’ countries of origin allow. “We must retain the protection character of our refugee operation and the social contract between UNHCR and the Government,” said UNHCR Representative in Chad Jose Antonio Canhandula. “We should also move on from offering assistance to investing in human capacities, and integrate the refugee programme into a broader development programme. Our international protection mandate cannot be fully achieved without ensuring food security for refugees and for their host communities,” he added. The joint assessment is available online in French. 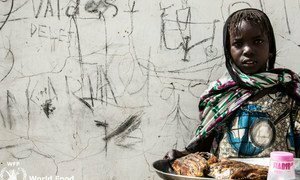 Important steps have been taken recently by several United Nations agencies in partnership with the European Union to help tackle malnutrition in Chad, especially in accessibility, availability and use of highly nutritious food for the most vulnerable, according to a joint news release.